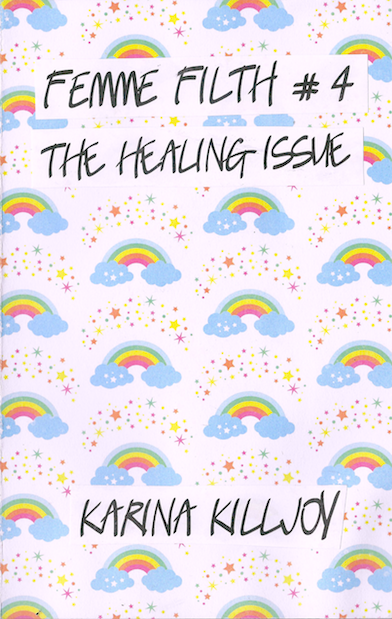 zines about radical vulnerability, queer femme magic, & healing as resistance. Femme Filth # 1 is an 18-page zine about living with borderline personality disorder and post-traumatic stress disorder, radical vulnerability, celebrating queer femmes, survival, healing, recovery, resilience, and mental health. Buy it here. Femme Filth #2 a 28-page zine about femme magic, radical vulnerability, and healing justice from the perspective of a sick & disabled, queer, femme survivor. This zine addresses topics such as protecting one's magic and energy; interdependence and community care; tangible, concrete, ways to support femmes; art, idols, and idolization as a form of dehumanization; and the challenges & complexities of healing from sexual violence. Buy it here. Femme Filth #3 is a 20-page zine about radical vulnerability, healing, and recovery. This zine explores how the author continues to nurture their healing process as they imagine futures for themselves, set intentions for 2018 & beyond, create affirmations for survivors, recommend readings and resources, & explore the joys of snail mail and penpalling. Buy it here. Femme Filth #4: the healing issue is grounded in femme magic, radical vulnerability, and survivor solidarity. This issue covers the politics of survivorship; thoughts on healing and vulnerability; guides on creating affirmation lists; helpful apps for survivors; things that have helped me heal; tips on supporting survivors in tangible & concrete ways; rants, musings, and scraps from my diary; & so much more! Buy it here. Print & digital copies of Femme Filth Zines are available on Etsy.